The only bad part of yoga last night was savasana, my favorite part (so glad I know how to spell and say that now!). What ruined it for me? The yoga teachers choice of music. I usually love the music she chooses for power yoga. However, last night, she decided to play this bluesy hymn sung by a male with a very raspy throat and it was not relaxing for me. It’s funny how music can completely change your mood. In a large pot, warm olive oil and add all vegetables (onion, fennel bulb, celery, garlic). When onion begins to caramelize, add broth and beans. Bring the soup to a simmer and add tofu. Add herbs and spices. 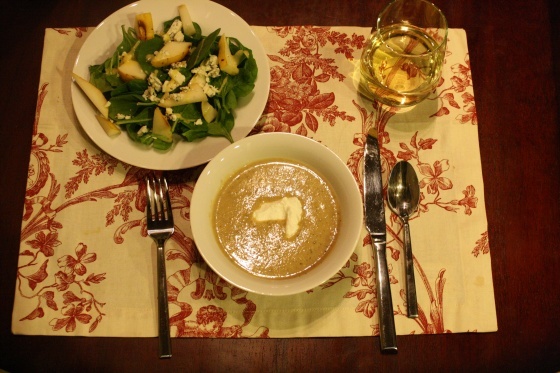 Blend the soup by transferring it to a food processor or using an immersion blender. Add corn starch and continue to blend (this will further thicken the soup). If you like, add more salt to taste. I topped our soup with Greek yogurt, because it goes on everything and anything as far as I’m concerned. 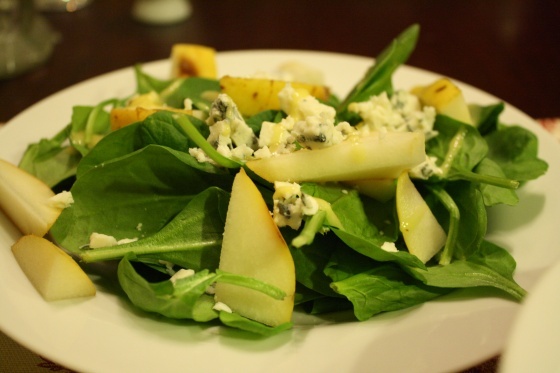 I served a simple salad of spinach, sliced pear, and Gorgonzola cheese on the side, with a sweet salad dressing I bought at the store. 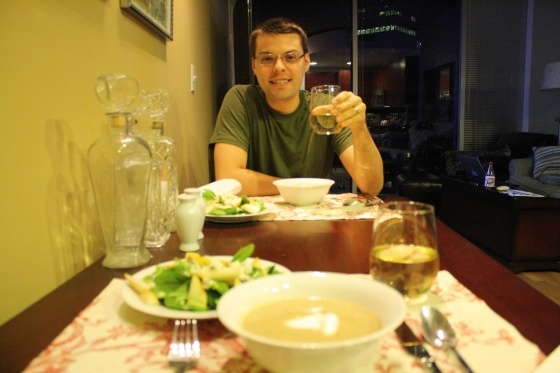 Brad gave this soup two thumbs up. I got a few, “So you thought this up all on your own?” “Uh, huh,” I responded. 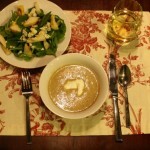 The fennel was subtle but added the essence of meatiness to the soup. Brad said he almost thought there was sausage in the soup but knew better because I had already explained to him that fennel is often used to flavor sausage. He was a little skeptical of the tofu at first (so was I). 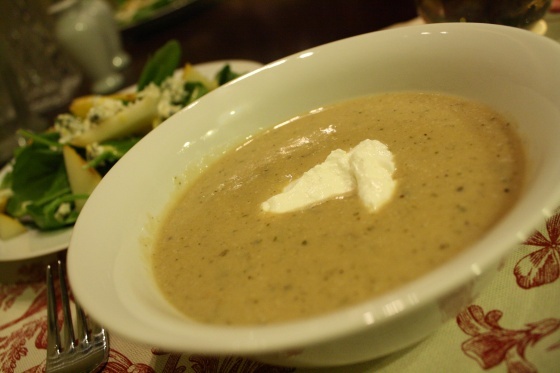 However, it turned out to be a great addition making the soup even more creamy and delicious. Note: That is not my Diet Dr. Pepper in the background. Cross my heart and hope to die. After dinner, Brad and I hung out listening to music and talking until he had to go pack up his things and catch his flight. He is going to Ohio for work for a few days so I will be having dinner for one and leftovers most of this week. How did you end your weekend?